If you’re reading this, you already know I go a bit overboard on privacy. I recently changed my mailing address, and it took some research, but I’m pretty happy with the result. Most of it was straightforward, but there’s one small trick that’s worth mentioning. There’s lots of existing knowledge on using PO boxes, ghost addresses, and CMRAs instead of your home address. (Why not your home address? A few thoughts.) Unfortunately, none of them are ideal. Ghost addresses are good for filling out forms, but not so good at receiving actual mail. 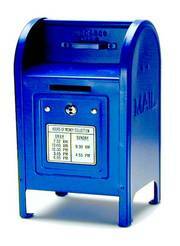 PO boxes are good for mail, but not packages, and you can’t use them for many purposes. CMRAs are the most promising. They give you a real street address, receive your mail and packages, and optionally forward them. More recently, they can open your mail (with your permission), scan it, give you the scans online or over email, and archive or shred the physical copies. Very cool. The catch is that USPS requires you to fill out and notarize form 1583 before a CMRA can open your mail, and that form needs two forms of ID with identifying numbers like passport or drivers license number. Ugh. Not cool. I wasn’t about do to that, so I found a loophole instead. You can’t avoid the ID requirement, but you can include additional people as addressees on the mailbox. They have to provide the same two forms of ID, but not if they’re minors! At this point, the game is won. Get a friend to help you, open the CMRA account in their name, and send in form 1583 with their info and IDs. Add your own name as an additional receipient in box 12, but don’t include your IDs, obviously. If they ask, say that you’re a minor. Fortunately, my CMRA never even mentioned the extra name on my form 1583. They don’t like the USPS form and ID requirement any more than I do, so they comply, but they usually won’t be aggressive about fine points like additional names. In practice, if they have IDs for the primary account holder, they figure that’s good enough. USPS too, probably. For bonus points, if you use an LLC, attach it to your account as another addressee, and then switch its registered agent to be your CMRA. May your mail be scanned, your packages forwarded, and your name and home address always hidden. Happy privacy-ing! Interesting. A lot of work, but interesting indeed. Is there a CMRA you recommend, even for just the convenience of it? Thanks! That’s super useful insight. And yes indeed about paperless billing. I’ve turned into an animal whenever I receive something in the post that could be better sent digitally. I hunt the sources of paper mail down ruthlessly. sure! i went with http://virtualpostmail.com/ . other candidates included http://travelingmailbox.com/ , https://mailboxforwarding.com/ , and https://earthclassmail.com/ . here are the (very rough) notes i took while i was researching: http://snarfed.org/cmra_research . maybe i'll clean them up into a proper post eventually, but no promises. good idea. I signed up, will test it out over the next month. I’d there any service where you don’t pay monthly but per mail and only more if they open and scan? +Jonas S Karlsson sorry, all of the ones i looked at had a monthly fee of at least $15 or so.frankly, if you’re interested, i say go for it anyway. i think many of us overvalue our money relative to our time and other more important things: http://snarfed.org/2012-08-12_time_is_worth_more_than_money . just my opinion though. +Jonas S Karlsson sorry, all of the ones i looked at had a monthly fee of at least $15 or so. interesting. the USPS is evidently considering a service that lets people anonymize their mailing addresses. that’d be great! Great article. Thanks for the info, you have made it easy to understand. BTW, if anyone needs to fill out IRS form 1583, I found a blank form here http://goo.gl/96lxTN.